Indian realty major, Unitech has said that it has resolved all legal disputes with Norway's Telenor, with which the company operated a joint venture in the telecom sector called Uninor. Unitech announced that it is disposing all of its shareholdings in the joint venture and exiting from the telecom sector in the country. Telenor has been asking its former partner to scrap the joint venture and wants to form a new entity with another company. The Foreign Investment Promotion Board (FIPB) has given more time to Norwegian telecom firm Telenor to announce its new partner. FIPB has permitted Telenor to hold the name of its partner for some more time and it has also decided to start the process of approving its planned joint venture, according to Uninor managing director Sigve Brekke. The Company Law Board (CLB) has referred the unfolding dispute between former partners, Norwegian telecom firm Telenor and India's Unitech, to arbitration on Thursday. CLB forwarded the dispute over management control and transfer of assets of their joint venture, Uninor to arbitration as per the request of Unitech, which wanted the case to be moved to an arbitration panel. Telecom sector player, Unitech is seeking an approval from the Company Law Board (CLB) to move a case against telecom joint venture with Telenor to an arbitration panel. Norway based-Telenor's legal representatives have said that they will oppose Unitech's petition on the next hearing this Monday. Telenor had earlier approached the Company Law Board in India to bar its Indian partner, Unitech from obstructing its plans to operate its operations in India through a new arrangement. Stock market analyst Hitendra Vasudeo has maintained 'buy' rating on Unitech Limited stock with a sort term target of Rs 120. According to analyst, the interested investors can buy the stock with stop loss of Rs 85. Today, the stock of the company opened at Rs 88.95 on the Bombay Stock Exchange (BSE). The share price has seen a 52-week high of Rs 108.55 and a low of Rs 66.95 on BSE. Current EPS & P/E ratio stood at 2.78 and 33.09 respectively. During the three month period ended June 30, Unitech Ltd announced a good growth in its standalone net profit. Stock market analyst P Phani Sekhar of Angel Broking has maintained 'hold' rating on Unitech Ltd stock to achieve a target of Rs 100. According to analyst, the said target can be achieved in a period of 12 months. The stock of the company, on Sep 06, marked its closed at Rs 83.50 on the Bombay Stock Exchange (BSE). The share price has seen a 52-week high of Rs 118.35 and a low of Rs 66.95 on BSE. Current EPS & P/E ratio stood at 2.78 and 29.69 respectively. Stock market analyst Hitesh Eidnani of Trend Tech Consultants is of the view that investors can buy Unitech Ltd stock with target of Rs 110 in 2-3 trading sessions. According to analyst, the interested investors can buy the stock with stop loss of Rs 79. Today, the stock of the company opened at Rs 84 on the Bombay Stock Exchange (BSE). Current EPS & P/E ratio stood at 2.72 and 31.26 respectively. Stock market analyst Nitesh Chand has maintained 'buy' rating on Unitech Ltd stock to achieve a target of Rs 92-95. According to analyst, the interested investors can buy the stock above Rs 85. The stock of the company, on August 05, closed at Rs 84.50 on the Bombay Stock Exchange (BSE). Current EPS & P/E ratio stood at 2.72 and 31.86 respectively. The second-largest property developer of the country Unitech has declared its fourth quarter financial results for the fiscal year 2009-10 and it has managed to post a huge rise in its net profit. The company has posted a net profit of Rs 144.87 crore for the quarter that ended in 31st March, 2010. The net profit was reported to be Rs 3.29 crore for the same quarter in the financial year 2008-09. This net profit figure has grown up by a mammoth 44 times in this quarter as compared to the same quarter in the last fiscal. Technical Analyst Sharad Avasthi of SKP Securities has maintained 'hold' rating on Unitech Ltd stock to achieve an intraday target of Rs 100. According to analyst, the investors can attain the target in 12 months. Today, the stock of the company opened at Rs 283.10 on the Bombay Stock Exchange (BSE). The share price has seen a 52-week high of Rs 314.70 and a low of Rs 158 on BSE. Current EPS & P/E ratio stood at 11 and 25.53 respectively. Stock market analyst Ashwani Gujral is of the view that investors can 'hold' Unitech Ltd stock with a stop loss of Rs 65. Today, the stock opened at Rs 72.20 on the Bombay Stock Exchange (BSE). The share price has seen a 52-week high of Rs 118.35 and a low of Rs 66.90 on BSE. Current EPS & P/E ratio stood at 3.31 and 21.51 respectively. Technical Analyst Kiran Jadhav has maintained 'hold' rating on Unitech Ltd stock with targets of Rs 139 and 150. Keep trailing stop loss below Rs 66, Mr. Jadhav said. Today, the shares of the company opened at Rs 80 on the Bombay Stock Exchange (BSE). The share price has seen a 52-week high of Rs 118.35 and a low of Rs 47 on BSE. Current EPS & P/E ratio stood at 3.31 and 23.18 respectively. Technical analyst Mehraboon Iran of Centrum Broking is bullish on Unitech and maintained 'hold' rating on the stock to achieve a target above Rs 98. Stock analyst also suggested investors to sell the stock after achieving the said target. Today, the shares of the company opened at Rs 83.30 on the Bombay Stock Exchange (BSE). The share price has seen a 52-week high of Rs 118.35 and a low of Rs 43.45 on BSE. Current EPS & P/E ratio stood at 3.31 and 25.29 respectively. India's leading Real Estate and Infrastructure Company Unitech has announced for a share swap. The board of Unitech has decided to go for a 1:1 share swapping. The company is the second largest real estate developer by market capitalization in India. As per sources the company has made such move to demerge its subsidiary Unitech Infra. Last year the firm was among the most recession affected companies in India. Its share price had come down to as low as Rs. 25 at the time of deep recession and global economic crisis. Stock market analyst Pradeep Surekha is of the view that investors can buy Unitech stock to achieve an intraday target between Rs 89-92. According to him, investors can purchase the stock with a strict stop loss of Rs 79. The stock of the company, on April 20, closed at Rs 83.50 on the Bombay Stock Exchange (BSE). The share price has seen a 52-week high of Rs 118.35 and a low of Rs 43.45 on BSE. Current EPS & P/E ratio stood at 3.31 and 25.76 respectively. 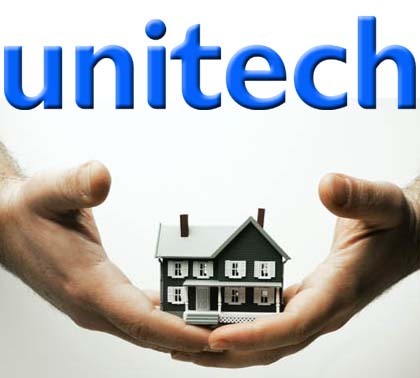 India's second largest realty player, Unitech has recently shown his intentions of inducting an advisor to facilitate the restructuring process of the company. Telenor Group has given the fourth and final round of the planned fresh equity investment to Uninor. Uninor, which is the brand name of United Wireless, specified that Telenor Group, with this investment, has pumped in total of Rs. 6,120 crore of new equity into the company, taking its ownership to 67.25 per cent, as per the shareholders' agreement. Uninor's application to increase its foreign shareholding up to 74 per cent in 2009 was approved by the Cabinet Committee on Economic Affairs (CCEA). Stock market analysts have maintained 'Sell' rating on Unitech Ltd to achieve a target that lies between Rs 75.25-74.50 today. If the stock fell below Rs 72, it may see more weakness. According to analysts, investors can sell the stock below Rs 76.50 with a strict stop loss of Rs 78. The investors are advised to sell the stock to avoid loss. After selling the stock today, the interested investors can buy it again for medium or long-term perspective.